In 1892, a societal outcast in Fall River, Massachusetts, bludgeoned her father and stepmother to death with an axe. The notoriety and subsequent trial (which resulted in an acquittal) is often considered to be the first “tabloid” news story of modern times. Considering the mystery surrounding the circumstances, and the pure evil of the act itself, Lizzie Borden’s story has fascinated audiences for years – having been the subject of various books, films, and theatrical works throughout the intervening time. 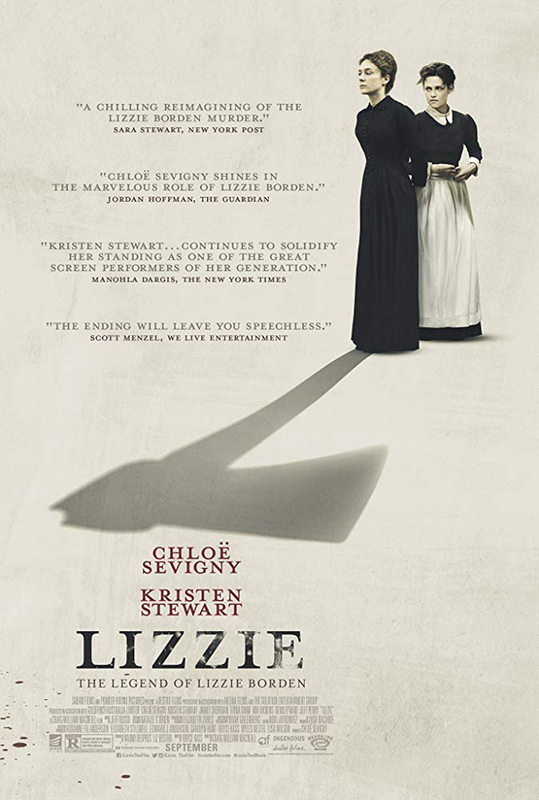 The latest incarnation of the Borden saga is Craig William Macneill’s “Lizzie,” staring Chloe Sevigny as the 32-year-old spinster and Kristen Stewart as Bridget “Maggie” Sullivan, the Borden family’s well-meaning Irish maid who forged a private and intimate relationship with Lizzie during her term of employment. Several theories have been proffered as to why (or even if) Lizzie killed her father, the most plausible of which is that wealthy businessman and landowner Andrew Bordon (character actor Jamey Sheridan) had recently spoken to his brother John about a land transfer in the event anything should happen to Andrew. This meeting took place after Bordon received several anonymous threatening letters hinting at his tragic demise. Bordon’s will left nothing to his two daughters, and even called for Lizzie to be institutionalized. It is presumed Lizzie overheard the conversation, which might have led to her decision to murder Andrew and his wife Abby (Fiona Shaw) so that the girls could then receive the Bordon fortune. No will was ever found. Bryce Kass’ original screenplay surmises that Lizzie burned it. A second theory is that Lizzie and Maggie were involved in a lesbian relationship, which would have been considered taboo at the time. Kass’ screenplay suggests that Bordon might have had a relationship with Maggie himself, although hardly any written material implies that this was the case. Apparently, Bordon had recently announced Maggie’s dismissal, which might have led to disappointment on Lizzie’s part. While this hypothesis may be true, Lizzie was smart enough to handle such a situation through means other than murder. Lizzie Bordon was an intelligent, sophisticated woman who would have quietly calculated her every move. “Lizzie” makes certain we know that she was advanced for her day, and was not afraid to stand up to her domineering father. This is one of those dark, quiet films in which the entire dialog could be printed on just a few pages. Every word spoken is carefully chosen and crafted. When Lizzie speaks to her father, her hushed words have the ability to cut like a dagger. To say that Andrew and Lizzie Bordon disliked one another would be an understatement. Still, Kass’ screenplay doesn’t do quite enough to establish Andrew Bordon as “worthy” of his fate. Painting him as a madman would have been over the top, but I believe a little more fortitude is required to warrant Lizzie’s action. As older sister Emma, Kim Dickens (still the best character actress nobody knows) walks a fine line between taking sides with either Lizzie or Andrew. She’s obviously Bordon’s favorite daughter, although that doesn’t count for much. She’s good to Lizzie, but oblivious to her relationship with Maggie. As Maggie, Kristen Stewart turns in the best performance of the entire film. Not only does she master the Irish brogue, but her eyes convey her wanton desire to become closer to Lizzie than society will allow. To Lizzie, their liaison may simply be another method of breaking down the strict barriers her father has placed on her development; to Maggie, these feelings are real. Stewart’s eyes also express disappointment and shock upon witnessing Abby’s murder. But then, without breaking character, she purports to assist Lizzie in the second. Since “Still Alice,” Kristen Stewart has developed into one of our very best young actresses. Still, “Lizzie” is not without its issues, first and foremost being that Lizzie Bordon had a handful of reasons to despise her father and stepmother. Unfortunately, “Lizzie” doesn’t zero in on any one argument, but merely throws them all at us in hopes that one will stick. The problem, of course, is that I may come away from “Lizzie” thinking she killed her elders for a certain reason, while someone else may believe a different speculation is true. Granted, there’s no way to know; but I wish Macneill and Kass would have at least latched onto the assumption they believe makes the most sense. Second, there’s really not enough material here to warrant a full-length feature film. It doesn’t take long to establish the Bordon family relationships, and the first hour of “Lizzie” is at times painstakingly slow-moving. The trial seems tacked on as a coda, or epilogue, to the murders themselves – when it probably could have served as the cinematic structure to tell the story in long flashback sequences. That’s a design I almost never propose, but I think it would have made sense here. After all, the Lizzie Bordon story didn’t even become big news until the trial. She was the O.J. Simpson of her day, but “Lizzie” gives short shrift to the legal proceedings. “Lizzie” is certainly not a bad film. But it could have been tightened a little to make it twice as effective. I would like to have seen what author John Grisham could have done with this material. As it stands, I have trouble recalling another film in which shocking axe murders seemed so routine and expected. Void of much dramatic tension, and using a well-known story as source material, “Lizzie” essentially adds nothing to our understanding of this outrageous chapter in American history.